Curitiba began a redesign of their urban landscape through a master plan adopted in 1960 and implemented over the next few decades. Public transportation, the center city devoid of private vehicles, miles of parks and walkways. Attention to recycling and environmental protection. A focus on education, culture and inclusiveness. Curitiba has the highest recycling rate in the World – 70%. 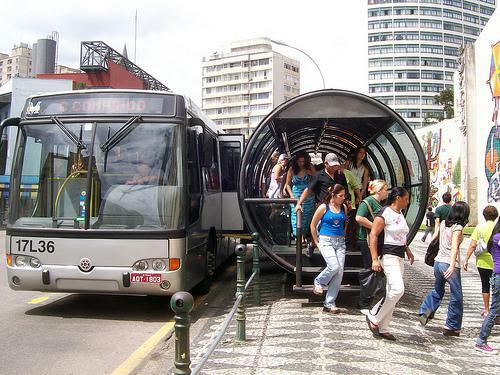 Curitiba has bus system that is so good that car traffic decreased by 30% while the population trebled in a twenty year period. Curitiba has the largest downtown pedestrianised shopping area in the World. Curitiba has built large numbers of beautiful parks to control floods rather than concrete canals. So many that they use sheep to cut the grass as it’s cheaper than lawnmowers. Curitiba is a city where 99% of inhabitants want to live. In comparison, 70% of Sao Paolo’s residents want to live in Curitiba. Curitiba’s average income per person has gone from less than the Brazilian average in the 1970’s to 66% greater than the Brazilian average. By the 1960s, Curitiba’s population had reached 430,000. Some residents feared that the growth in population threatened to damage the character of the city. In 1964, Mayor Ivo Arzua solicited proposals for urban design. Architect Jaime Lerner, who later became mayor, led a team from the Universidade Federal do Paranáthat suggested strict controls on urban sprawl, reduced traffic in the downtown area, preservation of Curitiba’s Historic Sector and a convenient and affordable public transit system. 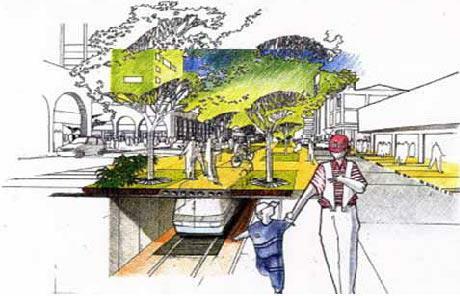 This plan, known as the Curitiba Master Plan, was adopted in 1968. Lerner closed XV de Novembro St. to vehicles, because it had high pedestrian traffic. The plan had a new road design to minimize traffic: the Trinary Road System. This used two one-way streets moving in opposite directions that surround a smaller, two-lane street where the express buses have an exclusive lane. Five of these roads form a star that converges on the city centre. Land farther from these roads is zoned for lower density development, to pull traffic away from the main roads. In a number of areas subject to floods, buildings were condemned and the land became parks. Today, Curitiba is considered one of the world’s best examples of urban planning. In 2007, the city placed third in a list of “15 Green Cities” in the world, according to “Grist” magazine, after Reykjavík in Iceland and Portland, Oregon in the United States. As a result, according to one survey, 99% of Curitibans are happy with their hometown. The “green exchange” employment program focuses on social inclusion, benefiting both those in need and the environment. Low-income families living in shantytowns unreachable by truck bring their trash bags to neighborhood centers, where they exchange them for bus tickets and food. This means less city litter and less disease, less garbage in sensitive areas such as rivers and a better life for the undernourished poor. There’s also a program for children where they can exchange recyclable garbage for school supplies, chocolate, toys and tickets for shows. Under the “Garbage? That’s not garbage!” program, 70% of the city’s trash is recycled by its residents. Once a week, a truck collects paper, cardboard, metal, plastic and glass that has been sorted by residents. The city’s paper recycling saves the equivalent of 1,200 trees a day. Money raised from selling materials goes into social programs and the city employs the homeless and alcoholics in its garbage separation plant. Open University, created by the city, lets residents take courses in many subjects such as mechanics, hair styling and environmental protection for a small fee. Retired city buses are often used as mobile schools or offices. Downtown areas were transformed into pedestrian streets, including a 24-hour mall with shops, restaurants and cafes, and a street of flowers with gardens tended by street kids. The “capacity building job line” was created to accelerate economic development. Key initiatives include the South-Circular bus line, which links the southern and eastern regions of town; Entrepreneurial “Sheds”, business incubators designed to help small companies get established and prosper; and the Crafts Lycée, which trains people for professions such as marketing and finance. Specifically, the goal is to provide jobs and income for the unemployed among 400,000 people living in 15 peripheral towns, and to structure and develop the region according to integrated planning principles. About 15,000 new jobs were generated by 2013. In the 1990s, the city started a project called Faróis do Saber (“Lighthouses of Knowledge”). These lighthouses are free educational centers that include libraries, Internet access and other cultural resources. Libraries work with municipal schools, offering a collection of approximately 5000 books, and provide cultural reference and leisure. Among Brazilian capitals, Curitiba has the highest literacy rate, and also rank number 1 in education among the Brazilian capitals. The transit service is used by more than 2 million people a day. The population has doubled since 1974, yet auto traffic declined by 30%, and atmospheric pollution is the lowest in Brazil.